With a minimum effort you can create a show-stopping experiance with our Faux Leather tiles. This product is perfect for ceilings, accent walls and headboards. We are going to show you in this short video how to install them on a walls due to its durability and easy maintenance, ceiling is very much the same application except you will be looking up. Miter or a Table Saw - If you are installing full panels only please dis-regard this option as you will not need to use the saw. If however you need to filling a whole wall and have to cut a power saw is a must. Power Grab (loctite) - Comes in a tube and it is available in most hardware stores. Hot Glue - You will also need a hot glue gun. Caulking Gun – If you decide to use Power Grab adhesive you will need this, look for one in your local hardware store. Level – A four foot level or longer will be needed to help you with finding your starting point. Ladder - Depending on your project you may need a ladder. Project Estimator - For your convenience please use our tile project estimator. 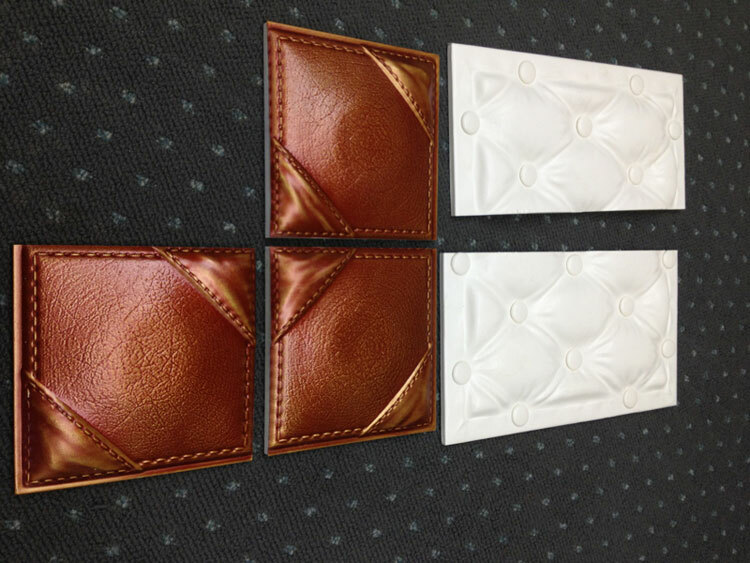 Here is an example of how nice of a cut you can get when using a miter saw to cut our Faux Leather Tiles. Gather all of your tools. Prepare your workspace and material to make it easy on yourself. It would be ideal to have a work-bench where you can keep your tools, apply adhesive to your tiles etc. but that is not always possible.. So do your best to create comfortable space to work. Also, be sure to clean your wall or ceiling from any dust, dirt, oil or anything else that could prevent proper adhesion. Your starting point may be in the center of your wall or ceiling but it also may be in the corner, it is important to find a great starting point and this can depend on project you are working on, your or your customers preference, what will look the best. If you working on an enclosed area, center is a good way to start but if you are working on an area that has an open side such as outside corner on a wall, starting there may be the best as you can start with a full tile and avoid leaving exposed edge which you would have to finish.. We can always give you our opinion on a specific project at 866-297-0380. Power Grab and Hot Glue work great! Be sure to apply enough glue trough out the tile to assure proper bond. In the video above you can see in detail how it is done. Rule of thumb is that going arround the edges creating a frame and then making an "X" connecting corners should be plenty. Make sure to install your tile exactly on your starting point and be certain it is level. Failure to do this may cause troubles installing your tiles correctly for the entire project. Once you are sure you have place the tile in the right position, press it firmly. Our tiles are ideal for commercial and residential applications. Walls, Headboards and Ceilings are the most popular uses for these tiles but you can get creative and use them as wall art. A popular way to use Faux Leather Tiles is to use them as an accent wall behind televisions. In this project the look is enhanced by illumination of the tiles. Not only are these tiles beautiful, they are also durable and for that reason the make great headboards. Using a heavy molding in a matching color this project is a hit. Yup, some people do decorate their ceilings even in a garage. For some it may be one of the most important spaces of their homes. This project is in Las Vegas, NV in a garage of an sports car enthusiast.